We are One of the Largest Private Dealers of League Sporting Equipment and Apparel in the Tri-County Area! If you are looking for a great deal on bulk equipment give us a call or request an online quote! As your local dealer, we strive to offer you the equipment you need, when you need it, at affordable prices. We have affordable Baseball & Softball Equipment that you need. Click on the image to the left to view our full 2019 Equipment Catalog. 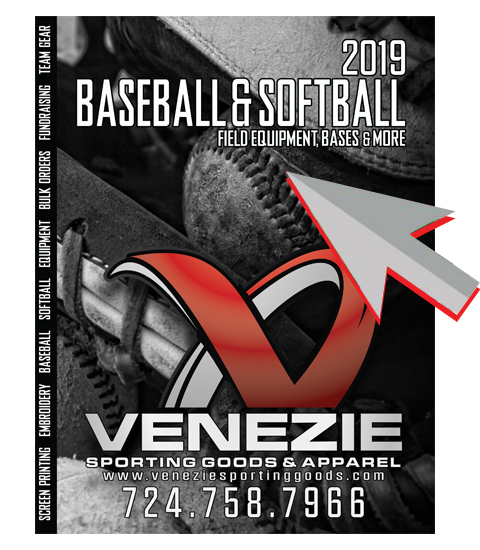 A small town store with big time appeal, Venezie Sporting Goods & Apparel offers all the sporting apparel and equipment for local sporting leagues and clubs and is also an officially licensed Wilson retailer.